What Am I Doing Out In This Heat? There has been a heat advisory out for our area all this week. Yet, it was the day of our weekly kite fly and I left the air conditioning and headed for the beach. Let me tell you, it’s not all that much cooler at the beach than anywhere else. Upon arrival, a couple of us spent some time in the parking lot trying to decide if we should fly or not fly. After all, who in their right mind would come to the beach today to fly kites? We would. Three of us headed to the flying beach, not expecting to have any other company. On the plus side, the wind was the best it’s been in a while. I grabbed only two kites, a single line kite and a soft stunt kite. I didn’t expect to stay long and didn’t want to lug the bags in the heat. After filling a sandbag for an anchor, I put up my Twin Tail Dragon by Into The Wind. I hadn’t flown it in a while so it needed to get out of the bag. It flew great. The wind was blowing about 15 mph and was perfect for the long tails on that kite. And I love the many colors. Then I went out to play with my Symphony 1.8 soft stunt kite. 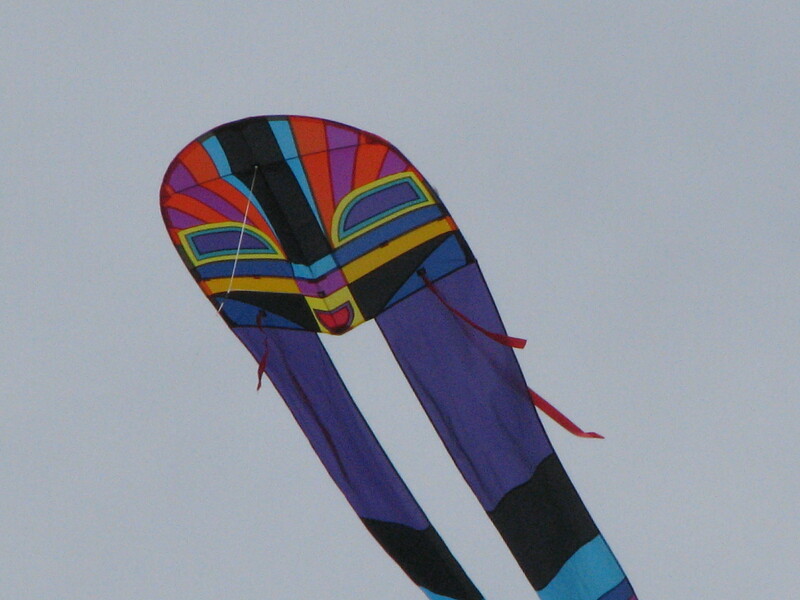 I had been ignoring this kite in favor of my quad line kite and my latest couple of delta-type stunt kites. So today was to be a fun day. Little did I know that the wind would pick up in just a couple of hours. The initial plans to not stay out long didn’t pan out. There were about three families from out-of-town joining us and flying their kites. They also wanted to visit and learn about the kites we were flying. Our local kite shop host pulled out the Symphony 2.2 for one of the visitors to try out. 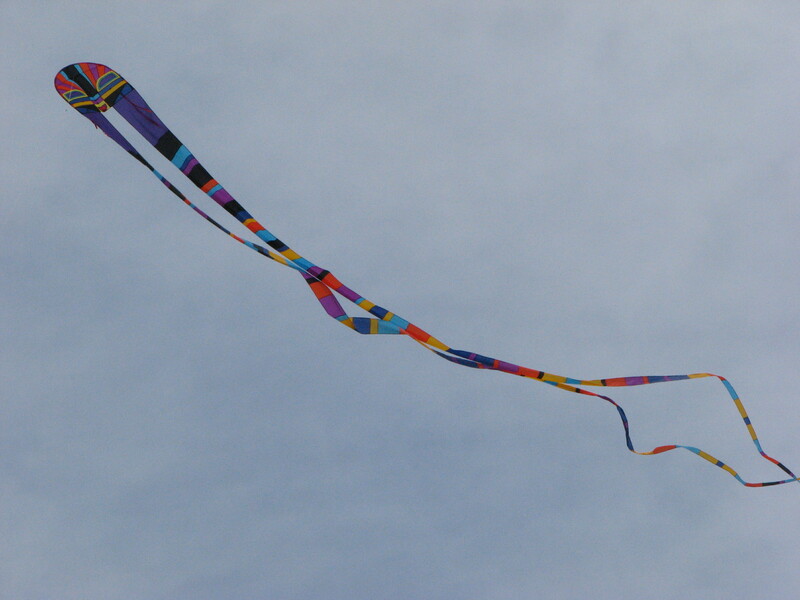 This is a larger kite than my Symphony and it has more pull. Both the father and the son tried this kite out and really enjoyed the pull and the speed. They had just purchased a smaller soft kite but I think their will be a larger one in their future. They had way too much fun. Even when the flying line broke when the son was flying. Guess the wind was picking up too much. I know I was getting a lot of pull from my 1.8 so I can understand why the son was digging himself into the sand as he flew. We’ll be looking for this family to come to the festival this fall. Another family came down with their kites. The father had a vintage Skywave kite. I would love to have one of these. He flew it for a while but, as the wind picked up, he decided it was a little too much and packed it away. They also had a couple of smaller single-line deltas up and they also took them down so they wouldn’t crash and break. The third family had a couple of smaller (shall I say cheaper) single-line kites that couldn’t handle the wind at all. But they tried. By this time I was ready to leave. The sand was blowing across the beach. The sign for me to pack my kites in the bags and head for the shop. I may be too cautious but I don’t want to have a major accident or an unrepairable kite. I will say that there was so much going on, I didn’t notice the heat on the beach. I guess I’m becoming more confident with my ability and my knowledge because I’m beginning to interact more with visitors. Now when I got back to the parking lot the heat factor hit. A little bit more visiting and I was ready for somewhere cool. It was a pretty good morning but now I’m going into hiding, at home, in the air conditioning.